Great mood. The frame also matches the subject. Well done. Glad to see this on the front page. It somehow missed my eye. This is just fabulous. I love a bicycle in a shot. 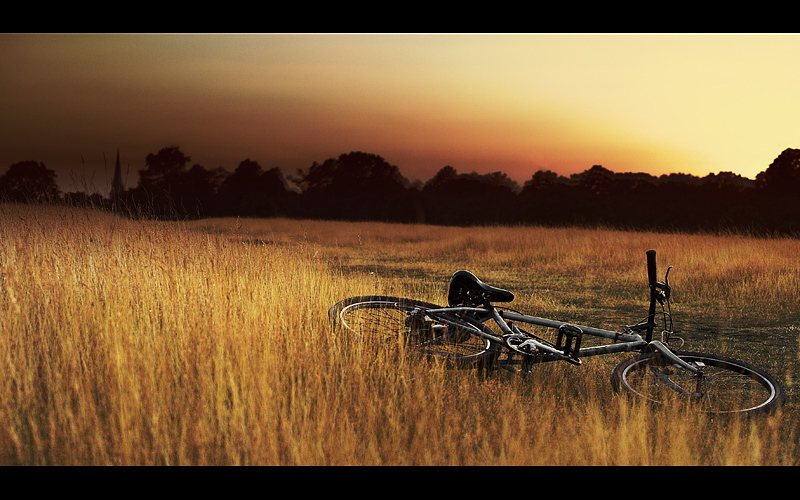 WOW - the angle of it amidst the golden grass is just beautiful. I like the hint of the church steeple in the background as well. Nicely done. I love this photo, the lighting and context work great. The lighting takes my breath away. The tones it creates... unbelievable. A one of a kind image. Fabulous shot. Wow. That looks like a scene out of a major motion picture. Brilliant. Beautiful image. Love how you've composed this and the tones are perfect. great color and composition as others have mentioned. an impressive piece over all; the border gives it a cinematic feel. This is gorgeous! The colors and the lighting pull you in. great work! Nice golden colors! Good work. Nice picture. Beautiful colors, love the scene. OH MY!!! I do have a thing for bicycles. This has a lovely tonal quality too. Did you use gradient?? Proudly hosted by Sargasso Networks. Current Server Time: 04/22/2019 12:02:40 AM EDT.